Now that we’ve had a chance to take a look at the construction and component selection of the MacBook, it’s time to get down the business end of the review: performance. For the sake of brevity I’m not going to completely rehash how Core M works, especially since we just did an in-depth look at the CPU last week. But briefly, from a performance standpoint Core M behaves a lot more like a modern tablet processor than it does a traditional Intel x86 processor. Which is to say that its performance is heavily tuned around performance bursting and racing back to idle, as opposed to more traditional Intel processors which turbo as well, but overall are also designed to hold at relatively high clockspeeds under sustained workloads. Of course all of this is in part dependent on how OEMs go and design their laptops – go stuff a Core i5 in a Surface Pro 3 and watch it throttle – but at the end of the day the point is that Core M is not designed to offer the same kind of high performance under sustained workloads that Intel’s more powerful processors do. Core M is at its heart still a power optimized Intel Broadwell design, so despite the different Core M branding it’s not all that far removed from the dual-core Broadwell-U processors in the MacBook Air and 13” Retina MacBook Pro. What sets it apart along with its package and power optimizations are its much lower power threshold – the official TDP is just 4.5W, while it can burst higher for short periods of time – and the fact that it’s designed for systems with less cooling than Broadwell-U. Case in point of course is the MacBook, which utilizes a simple aluminum case without any kind of fans (active cooling). The end result is that for workloads that go longer than a short burst, Core M’s performance is tightly coupled to the cooling capabilities of the laptop it’s in. Ultimately what this means is that we expect that the MacBook should be able to compete with its larger brothers in those short, bursty workloads that Core M is optimized for, while in sustained workloads it’s going to fall behind MacBook Air and other laptops using Intel’s larger 15W processors. We’ll kick things off quickly with a look at boot time. On an absolute basis the MacBook doesn’t do too poorly, but on a relative basis it’s behind a lot of our other MacBooks. To be clear here this is a historical chart – each machine is running the version of OS X it launched with – so the only Yosemite MacBook here is the 2015 MacBook. Still, whether it’s Core M or Yosemite, it shows that Apple’s boot times here aren’t quite as good as they have been in the past. Switching gears, we have an example of a semi-bursty workload with a couple of our web benchmarks. 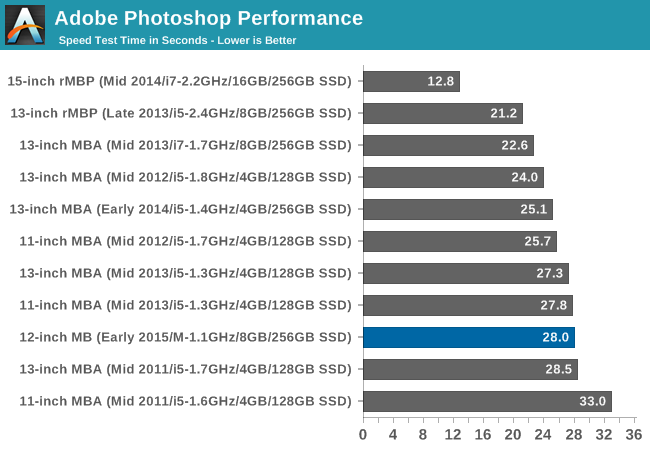 These benchmarks run a number of sub-tests, and as a result the MacBook gets a brief respite between benchmarks. 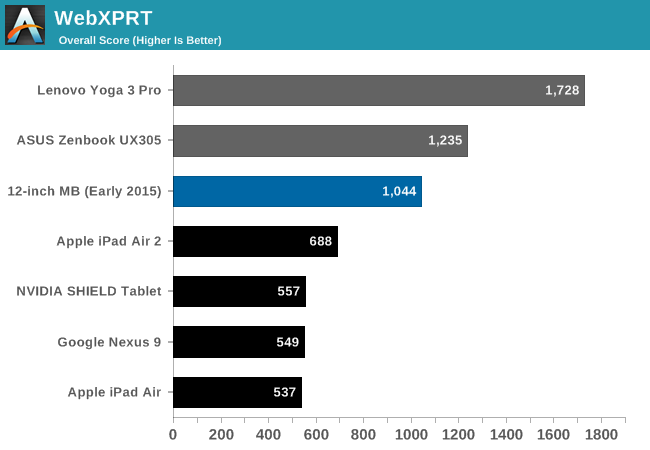 Plus this gives us a chance to compare the MacBook to tablets, including of course the iPad Air 2. Meanwhile since we’ve also just recently looked at several Core M devices, I’ve also included those to provide a point of comparison to other Core M devices. Truth be told these results are a bit surprising, though not for good reasons. 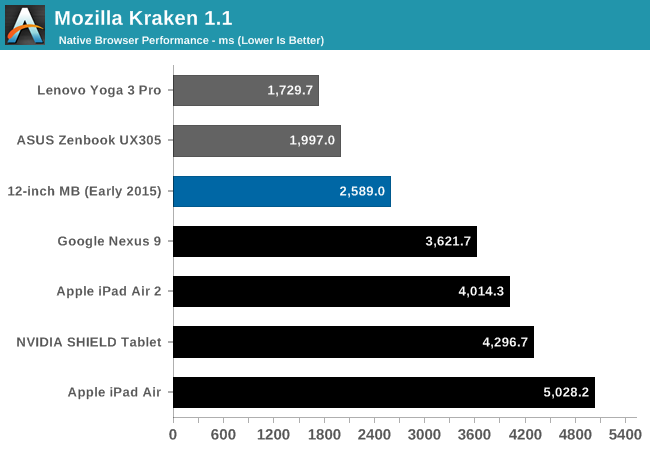 The MacBook ends up being a laggard against both of our other Core M devices. Since each platform is running a high performance browser (either Safari or Chrome) and from hardware capabilities standpoint these Core M devices are all relatively close, I suspect what we’re seeing here is that OS X Safari as not as well tuned as iOS Safari is. Compared to the tablets on the other hand the MacBook is still well ahead of any of the tablets – as it should be with Core M’s greater power consumption and the larger chassis – but there’s no denying that by scaling down the MacBook so far, the performance gap between tablet and laptop has shrunk significantly. The MacBook is less than 2x faster than the iPad Air 2 in both benchmarks, which means that within a couple of generations it’s likely that the iPad will exceed the current MacBook’s scores. If my earlier hunch about Safari optimizations is correct and OS X needs some more tuning, then the MacBook is farther ahead than what these benchmarks show. Still, it goes to show that although the MacBook is well ahead of tablets, it’s not leaps and bounds ahead like more powerful laptops would be. 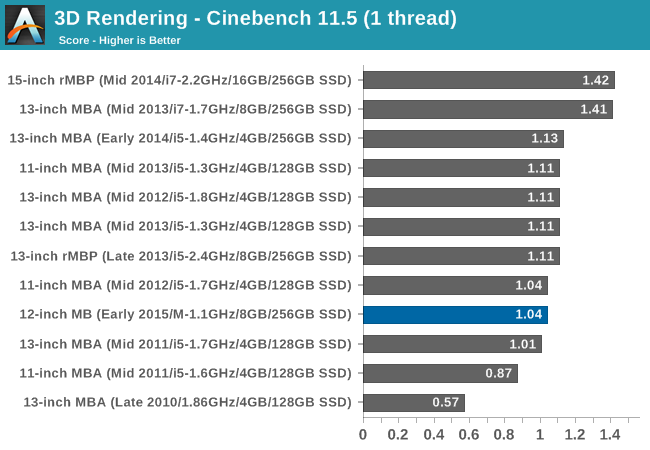 Meanwhile our large collection of Cinebench 11.5 results helps put Core M’s sustained performance in perspective. In both single-threaded and multi-threaded workloads it’s well behind the pack, though in different ways. 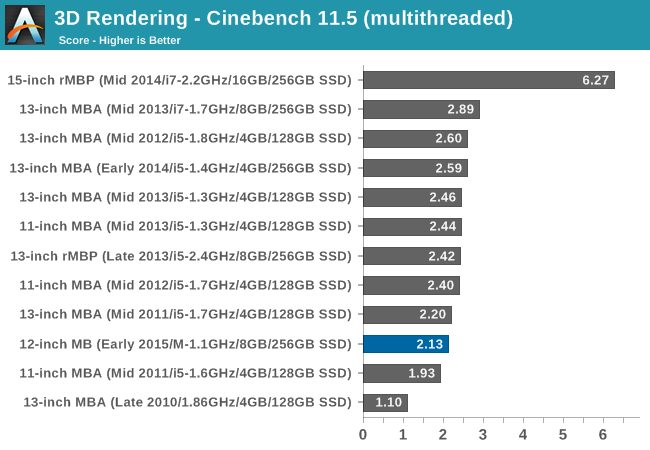 Single-threaded performance is essentially on par with the 2012 11” MacBook Air (Ivy Bridge), and even as recent as the Core i5-equipped 2014 13” MacBook Air the 2015 MacBook is within 10%. In this case what we’re seeing is a case where a lighter workload allows one of Core M’s CPU cores to stay highly clocked (remember, it turbos up to 2.4GHz), which means it’s actually rather competitive with recent Ultrabooks. Unless forced to throttle, Core M is still Broadwell, and Broadwell flies. Which means that when Core M is forced to throttle under the multi-threaded workloads, the performance gap widens. Ignoring the rMBP and its 4 cores, where exactly the MacBook places depends in part on the generation of the MacBook it’s compared against, followed by the CPU configuration. The base Core i5s in the MBAs and 13” rMBP are quite capable, with the most powerful of these surpassing the MacBook by upwards of 20%. In that respect the new MacBook is offering multi-threaded performance between the 2011 and 2012 MacBook Airs. On the other hand though we’re talking about the MacBook coming within 20% of larger laptops with much more powerful (15W+ CPUs), so while the MacBook can’t keep up, it’s also delivering quite a bit of performance for its size and power consumption. 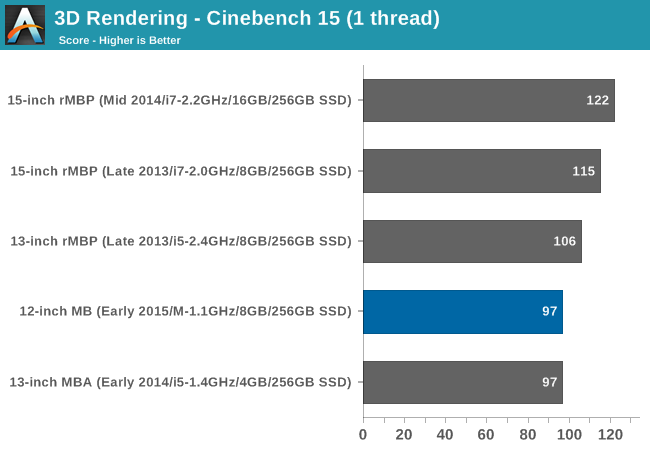 Our more recent Cinebench 15 results on the other hand find the MacBook at the bottom. Though this is in part due to a much smaller dataset we have (and mostly composed of rMBPs), it does drive home the point of just how wide the gap is between the rMBP and the new MacBook. If you want a powerful Mac capable of fast sustained performance, you’re going to want a MacBook Pro. That said, compared to the 2014 13” MBA, we once again see the MacBook holding up well in the single-threaded benchmark, outright tying last year’s larger MBA. This once again handily illustrates how Core M is no slouch with lightly threaded workloads, and how it’s heavily threaded workloads where it’s really going to need to pull back. Moving on, we have a look at Photoshop performance with the Retouch Artists Speed Test. This being another multi-threaded test, the MacBook throttles harder and this leaves it towards the rear of the pack. Performance is roughly on par with many of the Core i5 MacBook Airs, but it becomes a more significant gap once we step up to the i7, and I’d expect something similar if compared to a 2015 MacBook Air. From a throttling standpoint, at just 28 seconds long I don’t believe we’re seeing any kind of significant thermal throttling in this benchmark. Rather the MacBook is falling behind on the basis of maximum clockspeeds and power limits, having to pull back because sustaining 2.4GHz for 28 seconds puts it outside of its power envelope for too long. Meanwhile on a conceptual basis I don’t see such a small laptop as the MacBook being used too much for Photoshop, but out of all of Apple’s ultra-portables, the MacBook does end up being the best fit due to its excellent screen. 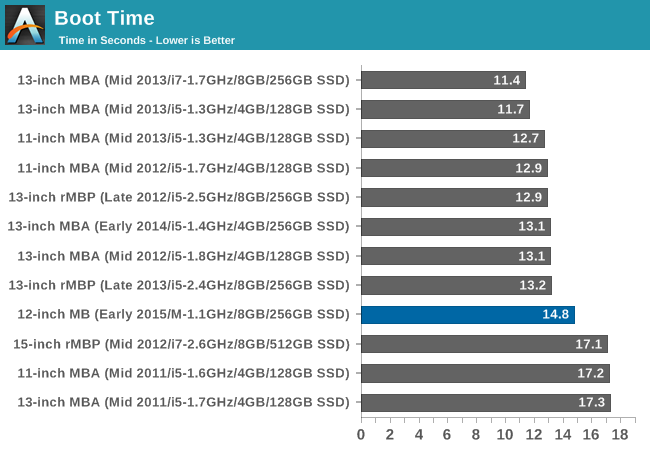 For our last benchmark we have Geekbench 3. Though a rather synthetic benchmark overall, it’s as close to a standard OS X benchmark as there can be. 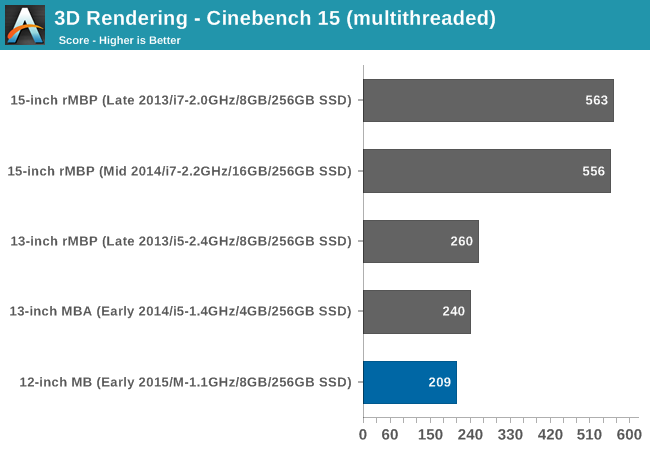 Pulling the standardized score for the 2015 Core i5 11” MacBook Air, what we find is that the MBA is ahead of the MacBook by a bit over 20% in both the single-threaded and multi-threaded tests. In terms of workloads I’d consider the single-threaded test to be a moderate workload and the multi-threaded test a heavy workload, so these results are generally what I’d expect to find. As neither workload is particularly light, it forces the MacBook to slow down a bit more, putting a bit more of a gap in between it and its Ultrabook-sized sibling. Meanwhile I also ran the Geekbench 3 stress test for a couple of dozen loops on the MacBook to see how much performance degrades over the long term. The MacBook reaches equilibrium at around 4200, which is a 9% performance regression over a fresh run of the multi-threaded benchmark. Given the MacBook's low thermal limits it actually reaches this point rather quickly, and other sustained workloads should reach equilibrium at a similarly quick pace. Finally, while looking at performance under OS X I also took some temperature readings while running Cinebench R15 and DOTA, to get an idea of how hot the MacBook gets under full load. Of the two benchmarks DOTA is the more intensive, pushing the GPU as well as the CPU. Consequently it also ends up being the warmest. Taken from the top of the MacBook, along the top speaker grill and roughly above where the MacBook’s CPU is, the MacBook heats up to 38C when running Cinebench, and 39.5C when running DOTA 2. These temperatures are similar to the skin temperatures found on most mobile devices, and even then, with the hot spot being in the grill above the keyboard, users shouldn’t be coming in contact with this hot spot. Meanwhile flipping the MacBook over and measuring the equivalent hot spot on the bottom finds that it’s appreciably warmer. We still haven’t seen a complete teardown of the MacBook, but we expect that the bottom casing is the closest to the CPU and consequently conducts the most heat. In any case we’re looking at 42C when running Cinebench and 43C when running DOTA 2. These temperatures are at the upper end of the comfort spectrum, but shouldn’t be an issue even with long-term use. More importantly, unless actually used in a lap, the MacBook’s rubber feet will keep the laptop propped up and avoiding contact with any surfaces, skin or otherwise. Do not agree, it is based on facts. I have after a few months had enough of the slowness, horrible new style keyboard and the one connector technology that forced me to buy 5 adapters, so I have one everywhere. Hopeless. Happy with mine. Wanted something slightly more powerful than an Ipad with a keyboard. I used to be a Windows/Linux/build your own PC person. Then I had kids/life got busy. Now the entire family is on Ical etc etc etc and changing back to Windows would result in a lot of headaches and time for the head of IT (ME). My time is my most valuable commodity. It's not a desktop replacement. It's for emails/word processing/web surfing. I've got a desktop, it's for all the other stuff. As much as I hate Apple sometimes (Their continued half assed product introductions and complete lack of clarity piss me off and their general neglect of OS X are real issues) it hasn't reached the point that I'm ready to jettison the apple ecosystem YET. I am happy with my Macbook too. I am a bluntly simple user of basic 'office productivity' apps, plus social fluff. I might be the ideal customer for the new Macbook because I upgraded from a 4.5 year old 11" Macbook Air. Compared to the older Air, the new Macbook is faster, lighter, smaller (but with a larger RETINA screen), and gets better battery life. Love the trackpad, and am ambivalent on the keyboard. I got the faster CPU which geek-benches similar to a 1-2 year old Air. Which is fine with me. Did it cost too much? Yup. Do I regret it? No.